Nearly 96 per cent of the 27,344 flats constructed in Delhi for economically weaker sections remain unoccupied, according to official data. 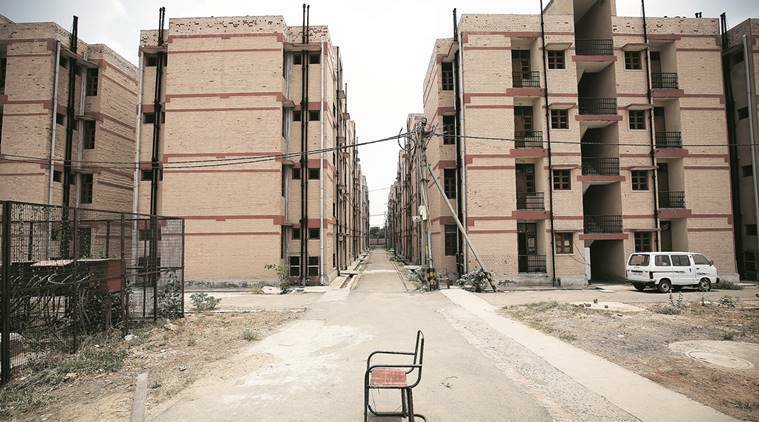 The story of these unoccupied houses leads to the story of Delhi's political rollercoaster ride between 2013 and 2015 and revision of eligibility cut-offs. A fresh survey of slum-dwellers is being conducted and will take about four months, said officials. Responding to a question raised by Congress MP R Dhruvanarayana in the Lok Sabha, the Ministry of Housing and Urban Poor Alleviation, on May 11, submitted details of houses constructed all over the country under the Jawaharlal Nehru National Urban Renewal Mission (JNNURM) and the number of these that remain unoccupied. Of the 10,32,443 houses constructed for economically weaker sections, 27,344 were in Delhi. Of these, 26,228 remained unoccupied, the ministry informed the House. The story of the unoccupied homes leads to the story of Delhi’s political rollercoaster ride between 2013 and 2015 and the attempts of administrators revising eligibility cut-offs to make more and more slum-dweller eligible for rehabilitation and housing. As much as providing housing for slum-dwellers makes for a shiny election manifesto, its implementation has had administrators labouring to keep the allotments fair, ensure genuineness of occupants and, most importantly, make more and more people eligible. The Delhi Urban Shelter Improvement Board (DUSIB) and the Delhi State Industrial and Infrastructure Development Corporation (DSIIDC) have constructed these houses under the JNNURM. The DUSIB, the agency tasked with rehabilitation, is also responsible for mapping of slums, identifying eligible persons, drawing lots, allotting the houses and vacating plots with slums. Since the DUSIB was set up in 2010, the cut-off for slum-dwellers eligible for housing under rehabilitation schemes has been revised four times. According to DUSIB officials, surveys to determine the eligibility of the residents of JJ clusters were conducted each time the date was revised. After 2002, the cut-off was set at 2007 and an evaluation was conducted once again. This time, officials said, of the total slum-dwellers in Delhi, about 35 to 38 per cent were found eligible for rehabilitation. The then UPA government at the Centre announced its intention to create a slum-free India in five years after then President Pratibha Patil unveiled the Rajiv Awas Yojana on June 4, 2009. “So, this became the next cut-off date to determine the eligibility of slum-dwellers to avail of rehabilitation by the government,” said a senior DUSIB official. Between April and August 2013, DUSIB issued eligibility documents to 4,100 slum-dwellers. However, after this round of evaluation, only 47 per cent of the applicants were found eligible. Another DUSIB official said, “In 2013, Delhi was supposed to go to polls. At a time that Delhi was preparing for elections, no government wanted to announce a policy that denied 53 per cent of slum-dwellers rehabilitation. The policy needed review but it was kept in abeyance during the election period.” With the AAP’s debut in Delhi assembly elections in 2013, the Congress government was voted out of power. While the AAP took charge of Delhi’s administration, its first innings lasted 49 days, too short a time to review or notify the slum rehabilitation policy of the DUSIB. For the period between 2014-2015 when Delhi did not have an elected government, and was governed by the Lieutenant Governor, no further measures could be taken for the revision or implementation of the policy by the DUSIB. The DUSIB is headed by the Chief Minister of Delhi. After the AAP came to power in February 2015, the slum rehabilitation policy was revisited. In December 2015, the Arvind Kejriwal government announced its new slum rehabilitation policy, setting the cut-off for eligibility for alternative accommodation at January 1, 2015. The ‘Delhi Slum and JJ Rehabilitation and Relocation Policy, 2015’ was approved in a meeting chaired by Chief Minister Kejriwal. Under the new policy, the DUSIB will plan and implement in situ (natural or original position or place) rehabilitation/redevelopment of JJ clusters wherever it is technically feasible; in other cases, DUSIB will resort to nearest possible relocation. Meanwhile, many of the houses constructed by the DUSIB and the DSIIDC were ready. The construction of two JNNURM projects undertaken by the DUSIB in Dwarka Site-II and Dwarka Site-III were completed in September and February 2013, respectively. Senior DUSIB officials said while the new rehabilitation policy of the government was yet to be notified, it was tested in the rehabilitation of slums in Jwalapuri carried out as an exception in accordance with orders of the Delhi High Court. “This was a case by the Virat co-operative housing society that had started during the Sheila Dikshit government. However, the DUSIB had to rehabilitate a JJ cluster in compliance with the orders of the high court. The cut-off date of January 1, 2015, was tested on these slums and more than 90 per cent of the people were then found eligible for rehabilitation,” said a senior official. Officials, however, said a fresh survey of slum-dwellers is being conducted using the new cut-off date. This will take about four months, before allocations begin, the officials added.